Complete installation service - from start to finish is what you can expect from the professional team at Surface Source Design Center. Surface Source Design Center offers complete installations for flooring. The mark of a good installation is no mark, because an installation showcases your new flooring, not itself. Keeping control of the quality of the installation is why Surface Sources Design Center has an in-house team of installation experts. We use an artisanal approach to growing our floor installation team. We use the apprentice system to develop our installers. All of our installers are expected to attend the clinics and short courses offered by manufacturers to introduce new flooring and updates on installation techniques. A key to a successful installation is accurate measurements. We use the measurements to calculate the amount of material needed. At the same time, a plan of work is made from the measurement with diagrams showing where seams and joints can be made inconspicuously, and if using carpet, which way the nap will run. These diagrams are done before the estimate is submitted because their findings can influence the amount of flooring ordered. Closer to the day of installation, wood flooring will be delivered to your home to acclimate. 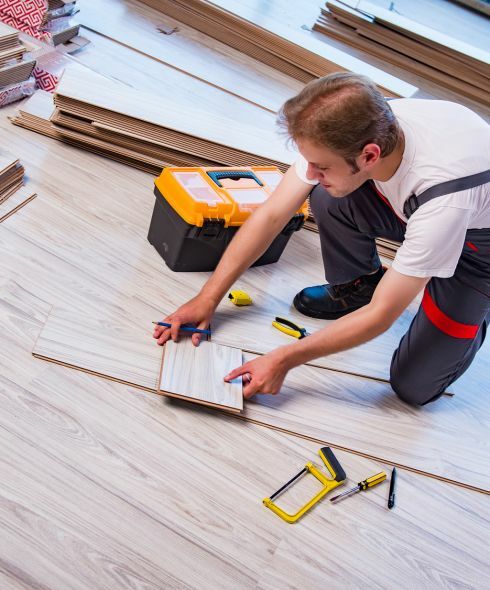 Since hardwoods expand or contract moving from one environment to another, having them in place before their installation takes this into account. Manufacturers specify the acclimation period for their products. This care is taken to reduce the likelihood of the wood splitting or cracking when it is installed. If we can assist you with this list, please let us know. When the installation is done and cleaned up, we ask you to walk through and note any adjustments needed. If there are any, they will be done immediately. Surface Source Design Center prides itself on a job well-done and won’t settle for anything less. Visit our store in Belton, TX if you live in Belton, Killeen, Temple or Salado, we serve customers in all of these areas. We are looking forward to discussing your flooring and flooring installation needs.